Community concerns topping surveys: Crime prevention services; street, sidewalk and greenspace Improvements; youth programs and facilities; workforce development. 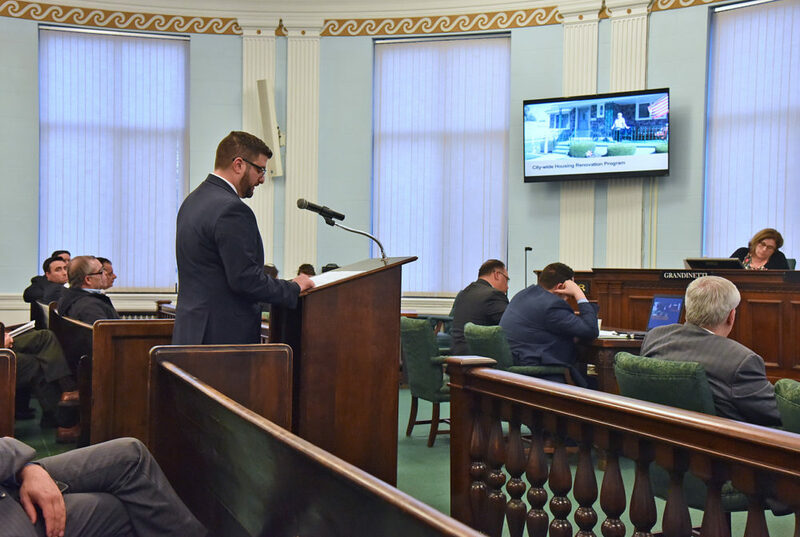 “At the March 20th City Council meeting, Niagara Falls Community Development will place the 2017 Community Development Action Plan on the council agenda for a vote,” said Niagara Falls Community Development Director Seth Piccirllo on Monday at the common council meeting. “Consistent with our transparent process, I am giving this presentation today, two weeks before that vote, as a final opportunity to answer any questions, and to give time for final review,” he said. The 2017 action plan is year three of our 2015-19 Five Year Strategic Plan. Based on our projections, it consists of $2.8 million in federal investment, $2.1 million in non-municipal matching funds for a $4.9 million total leveraged plan. As a quick refresher, we have used action plan funds to achieve tangible, quality of life improvements in our neighborhoods. As I have reported in the past, we saw a 200% increase in first time home buyer grants from action plan 2014 to 2015 and 2015 action plan housing renovations were at a 8 year high in that same year. Going back to the 2017 Action Plan, this is the 11th public meeting that our draft action plan is being discussed at since November 1, 2016. We hosted eight neighborhood workshops, increased from four in past years, throughout the city in November to gather community input, priorities and ideas. At the same time, we released a paper and online citizen survey to gather the same input, created a specific email address for action plan dialogue as well as competitive electronic applications for the CDBG, HOME and ESG programs, due December 16, 2016. We took all of that interaction and information, referred back to HUD regulations and our five year strategic goals, and created a draft action plan, released it on our website, made it available at both libraries and the Carnegie Building on January 25. We then created a companion citizen survey that highlights our plan, funding sources, and why public input is so important to the process. On February 2, we held a formal public hearing to go over the draft plan, project by project here at city hall, then had a more informal Pizza with the Plan on February 7 at the Carnegie Building, where residents could write post it note comments on each project description posted on the wall. Finally, there has been a 30 day public comment period, from February 2nd to today, during which residents could mail, drop off or email comments on the plan. All of these dates and meetings have been advertised or reported on our website, the city’s website, the Niagara Gazette and our Facebook, twitter and Instagram pages. We had over 100 attendees at our community meetings and 60 survey responses. In total, our 16 week Community Development Action Plan participation process proves that this budget has been indeed built by the public. I feel confident in saying that we have the most extensive public outreach process in the region or state, and I want to thank our community development team and all of the residents and organizations that participated. In the 2017 draft action plan, our department and the community’s priorities are clear – housing renovations, support for first time home buyers, continuing the trend of park and public space improvements and facilities and programs that support our youth. Our funding commitments reflect those priorities. We are also doubling down on community input as the driver of the decisions we make and the projects we execute. The draft includes $360,000 for participatory budgeting. PB is a democratic process in which community members directly decide how to spend part of a public budget. It enables taxpayers to work with government to make the budget decisions that affect their lives. Though each experience is different, most follow a similar basic process: residents brainstorm spending ideas, volunteer budget delegates develop proposals based on these ideas, residents vote on proposals, and the government implements the top projects. Essentially, every/any resident gets equal access to decision making, which levels the playing field. When people spend months discussing project ideas, they end up prioritizing projects that address the greatest community needs. While CD has always relied on public participation to make decisions, the input has been advisory in nature. PB makes public input, in the form of budget development and voting, the primary decision maker. We will look at public park recommendations, outlined in the 2012 parks master plan, that have not been completed yet, and form public committees to plan the actual projects, then go directly to the community for a vote with electronic tablets on a project ranking and ultimately which projects should be completed. Time and again we are reminded that our best projects and initiatives start with the public’s ideas not ours. PB is our way of taking that community partnership and trust to the next level. Traditionally, HUD-funded renovations in the City of Niagara Falls have been geographically divided into target areas administered by CD, Center City Neighborhood Development Corp. (Center City), Highland Community Revitalization Committee, Inc. (HCRC) and Niagara Falls Neighborhood Housing Services, Inc. (NHS). The 2017 DRAFT Action Plan proposes one city-wide target area, managed by a Niagara Falls Housing Consortium of Center City and NHS, in partnership with HCRC, and overseen by CD. All Niagara Falls residents would have access to the same closing cost and housing renovation programs and same guidelines, regardless of address. This is a departure from past years, when programs offered were specific to the target area’s guidelines. We believe that one city-wide target area is more equitable. This concept has been discussed with the Center City, NHS and HCRC over the past year, as a collaborative effort to promote and manage our programs as efficiently as possible. As a broader concept, this approach has been discussed for over 20 years. This change will not impact any of these organization’s board autonomy, staff or missions. Over time, this approach will reduce overhead costs, make it easier for residents to access housing renovation and closing cost grant assistance, and modernize our overall approach to neighborhood revitalization.